Canon 550D / T2i / KISS X4 - Monq'e'bobber B2 from Sid on Vimeo. 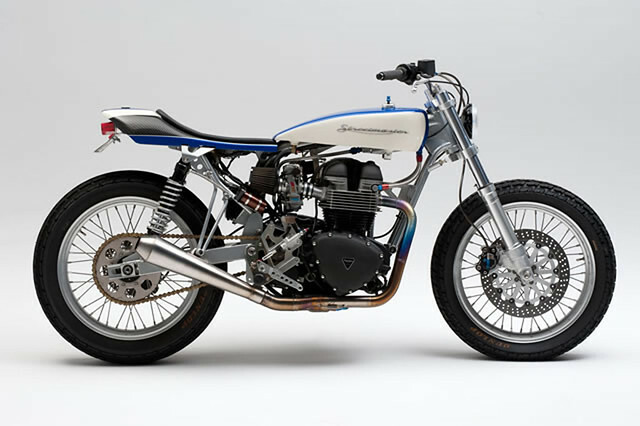 From their description, “Motorcycle references pepper the collection, partly due to the culture for customisation on the streets of Edwin’s home city – Tokyo and simply down to the feelings one experiences riding a motorcycle with friends. A sense of freedom, and of sharing with others the same need for flight and independence. Customisation of ones own motorcycle parallels breaking in ones own denims, unique in spirit.” Fun to watch and it’s a fun song. BikeExif has a great article on a custom Triumph Speed Triple. Wrecked Metals create some sweet rides! The video is mostly cars, but still fun to watch. Based in Boise, Idaho, their car club is called “Farm Boys”. One of their current projects is an old shovelhead. La Petite Meca is a custom motorcycle shop in Paris, and here they customize an old Harley Davidson. Nice, intimate view as he works on the bike. Re-Built from Louis David Najar on Vimeo.